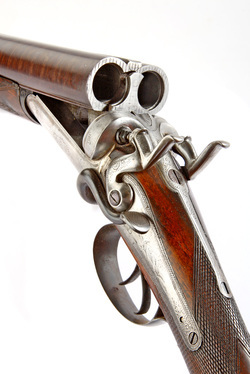 As a fully equipped repair workshop all types of firearm restoration can be undertaken on the premises. From simple refinishing, blacking, browning, of metal work, re-oil finishing, chequering, repairing of damaged wood work including full restocking, to the making of damaged or even missing parts. The only work we routinely out source is engraving, and for that we use one of the best gun engravers available. This is a lovely old hammer gun that I restored about twenty years ago. I will upload a more detailed article about this gun shortly, but for now a very brief description. It was in a terrible state though. The ribs were off, the barrels were siezed to the action, in fact everything was siezed, even the side lever. It was covered in mould and rust, but after much work it is now a lovely usable classic.